In third grade, I knew a kid named Starquis Matheny. We called him “Star” and he was considered pretty cool because he actually had a star shaved into the back of his head. That’s something my barber could never quite grasp. Trust me I asked. 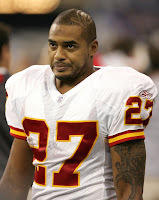 So yeah, someone tell Larry Johnson it was phat to shave things into your head about twelve years ago. As long as you were eight years old. Johnson never really got things going today and Trent Green out-sucked Peyton Manning as the Colts advanced to play at Baltimore next week. Posted by Dan McGowan at 1/06/2007 hype it up! I think he was just worn down out there... all those 400 and some carries during the year.